In fact, I vaguely remembered how I presented the situation, but as soon as he mentioned it, I knew what he was talking about. He was just a little kid at the time, probably four or so. After all, we only lived in that house until he was five. I had found a “treasure chest” at the Christmas Tree Shop, and I thought it would be the perfect addition to his room to contain his toys. 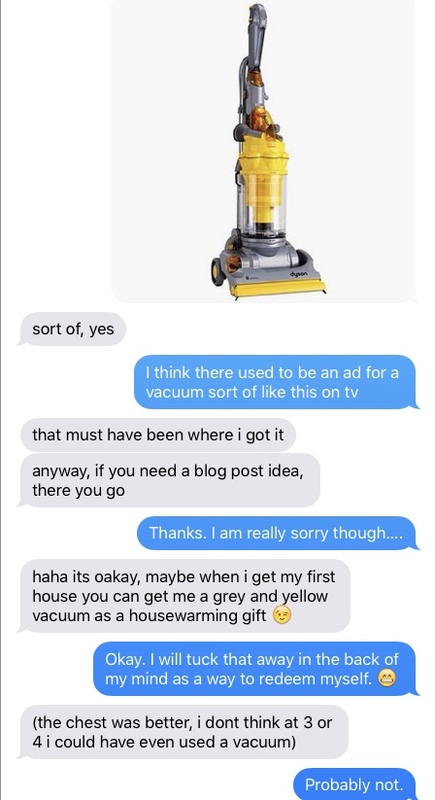 He went on with the text exchange to let me know that at four, he had thought he was going to get his own vacuum, and he was very excited. 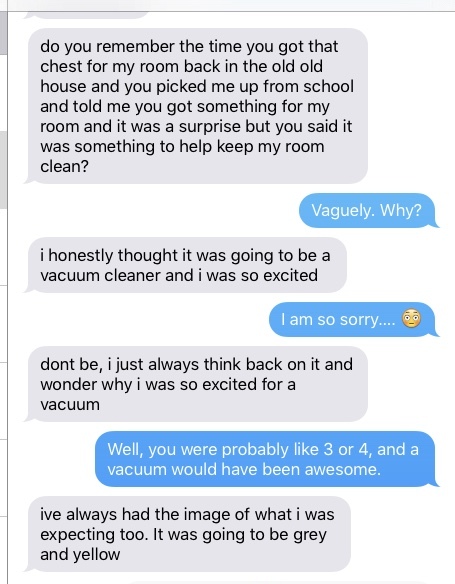 Now, on the one hand, I wish I had known that he wanted a vacuum because I probably could have capitalized on that. But on the other hand, I know he was likely only three feet tall, at best, and I doubt he would have been able to handle a vacuum of his own. I wonder why it is that we don’t create child sized working appliances, like vacuum cleaners? Instead, we create toy vacuums and toasters, blenders and lawnmowers. I understand why some of these things could not be actual, functioning appliances (lawnmowers, for example). But hey, it seems my kid would have been all over vacuuming his own room at four years old because at four, a vacuum is a pretty cool item. And if he were vacuuming himself at that age, he might have saved me some time on cleaning. Then again, I might have had to spend an inordinate amount of time searching the vacuum bag for trinkets that were accidentally run over and sucked up in his youthful excitement and inexperience. Sadly, I will never know. But at least now I know what to get him for a housewarming gift! HAHAHA! Ok, I found this so darn funny, but it’s also incredibly endearing. Thanks for sharing this exchange with us!